Call it a musical homecoming, a jazz family reunion. This special performance marks the beginning of the Vail Jazz Party with a multigenerational tour de force. 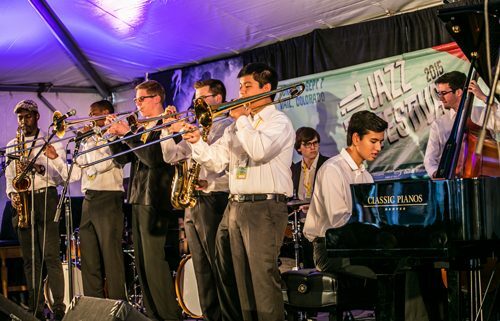 The evening opens with the Vail Jazz All Stars, a dozen of the best and brightest high school jazz players fresh out of the Vail Jazz Workshop whose infectious enthusiasm and precocious talent always brings Vail audiences to their feet. Next, the Vail Jazz Alumni Quintet takes the stage, featuring five former Vail Jazz Workshop students handpicked from its 23 years of alumni. This year features Luke Celenza (piano ‘09), Zach Brown (bass ‘07), Cameron MacIntosh (drums ‘12), Hailey Niswanger (alto saxophone ‘07) and Jeffery Miller (trombone ‘13). The grand finale of the night is the Vail Jazz Party House Band, comprised of the Vail Jazz Workshop instructors—John Clayton, Jeff Clayton, Bill Cunliffe, Terell Stafford, Wycliffe Gordon, and Lewis Nash. Buy your tickets early; it’s always standing room only as six of the world’s most revered jazz mentors take the stage with a coterie of their top disciples on this very special night.